Catalog Page 3. 10" Elrud Bears. 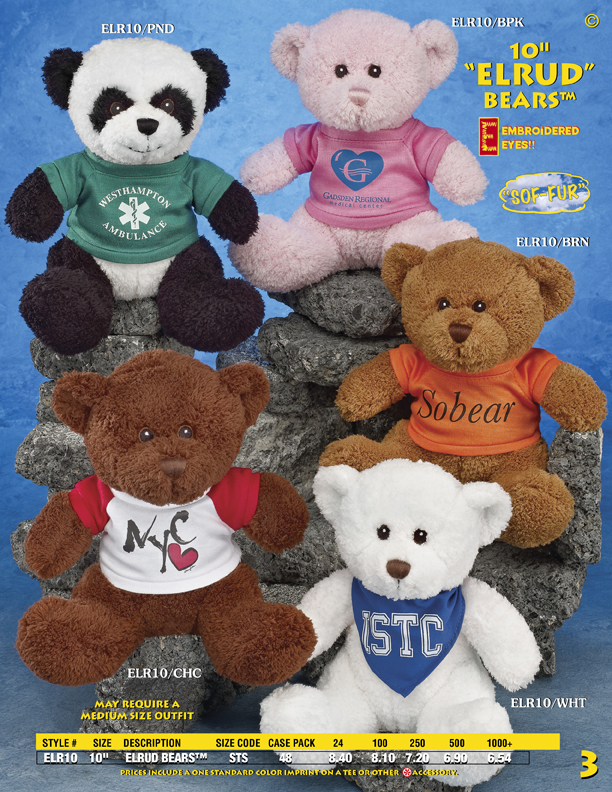 The 10" Elrud Bears are available in five colors: white, pink, brown, chocolate and panda. These bears have embroidered eyes. The set-up charge is $25 per order. This includes a one-color red, blue, white or black colored imprint. Otherwise, please add $50 for PMS color matching. The lead time for production is 14 days. We are shipping from New York. We offer a variety of shirt colors. If you visit the Accessory Index, you will find all the shirt colors available under size code STS. We can print on the front or rear. You can mix and match shirt colors and animal colors without charge, as long as the logo remains the same color. This allows you to have a variety of animals and colors to match most themes.